It is a truism of the business world that it costs more to acquire a new customer than it does to retain an existing one. It is also a truism that every business extracts a relatively predictable economic value from a given customer based on amount of money spent with a company minus the amount of money it cost to acquire that customer. A company that can focus on successfully increasing this ‘customer lifetime value‘ (‘CLV’ or ‘LTV’) by providing ongoing value to customers and nurturing the relationship can meaningfully improve its bottom line profitability. Having said that, wow do I hate receiving junk in my work email. Like most of us, I have multiple email accounts: work, personal, personal number two, and junk. My junk email is an account I use specifically to sign up for random websites, to conduct ecommerce, and to avoid the mailing lists that my accounts inevitably (and magically) appear on. This doesn’t mean that various newsletters, marketing campaigns, and other communications don’t slip into my work email, it just means that I try hard to limit those and will not hesitate to clink ‘unsubscribe’ when necessary. But there are still many lists from which I do not unsubscribe. These are the ones that don’t just market to me, but the ones that also provide me with something more: knowledge or entertainment or ideas that I deem worthy of consumption. A company that can keep my attention is also a company whose marketing message I am much more likely to accept and act upon if I believe the value is good. A great example of this for me is a company based here in Chicago, Homemade Pizza Company. This is a great chain of takeout pizza stores that sells, high-quality, fresh, gourmet pizzas that you cook at home in the oven or on the grill. They have a great product and a great marketing team. I probably receive 1 or 2 of their emails a week and I allow them to continue sending to me because 1) I like their product, 2) their emails are always colorful and attractive with great written content and pretty photos of yummy pizza, 3) because they often provide me with tips and ideas for preparing meals (I like to cook), and 4) because the emails often come with coupons or other discounts that I can take advantage of. In short, Homemade Pizza has succeeded in holding my interest, building a relationship with me, and increasing my LTV by encouraging me to come back and buy another pizza (or a salad – they also make great salads). Email campaigns specifically targeted at an existing customer base take careful strategy, artful tactical execution, an awareness of audience and messaging, and careful analysis in order to be successful. Here are 5 best practices to consider as you launch your own email campaigns. 2. Target and segment. Pick and choose among your customers as you design your campaigns. If you have a reasonably large list it is to your advantage to segment and target carefully within that list. Remember that not every customer is alike and what one finds valuable another might find useless. We tend to send offers out regularly, but they are typically sent to a smaller slice of our base rather than the entire list. For instance one week we might send something out only to new customers who have registered on the site in the past 6 months. Alternately we might send a mailing to ‘power’ buyers who have posted 10 or more projects with us over the years. We probably have 10 active segments going at any given time and we constantly look for new segments to target as long as we think that we can give them something that will be of value to them. 3. Subject line is critical. Keep subject lines short and to the point (under 50 characters is a good rule) and make them compelling – creating some sense of urgency is important. The goal of the subject line is to increase your “open rate,” or the percentage of recipients who actually view your email. 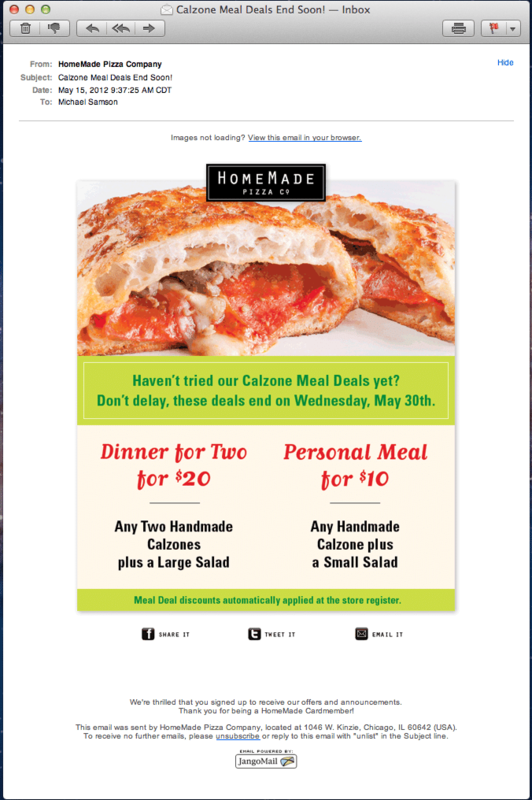 Your subject line should grab attention and serve as a call to action, so offering a discount or other freebie directly in the subject line can sometimes make a big difference and can incentivize readers to open and read your mailing: “$25 off today!” “But on pizza, get the second for free!” It is also a great idea to test different subject lines to see which is more effective; most email providers offer this feature and will allow you to split your list in order to try out different subject lines to compare results in open rates, click throughs, and conversions. Keep careful track of which work best and stick with the winners. 4. Recognize the risk. Because there will always be someone on your list who really doesn’t want your emails, there will always be unsubscribes, opt-outs, and complaints. This means that every time you send a mass email to your customers you are taking a risk that you will lose some or that you may even be reported for spamming. These actions have a real impact: a lost customer represents an overall decrease in CLV, and spam reports (if enough of them are generated) can sometimes result in an ISP (Internet Service Provider) blocking your emails from all of their users. You can imagine the impact on your mailing list of Yahoo put you on its blacklist, right? It is important that you track this data – keep a sharp eye on the percentage of recipients who unsubscribe and the number of spam complaints your emails receive. If either of these are increasing you have a problem, and should look very carefully at your overall strategy, including timing, targeting, and content. 5. Track it. Every email provider offers told for reporting and analysis of your mail campaigns. Mailchimp (which we use for our newsletters and marketing campaigns) provides simple and powerful reporting which, among other things, allows us to track each campaign individually, compare to past campaigns, a/b test subject lines, and experiment with sending campaigns on different days of the week as well as times of day to track the results. Remember that many people HATE email and view your marketing messages as spam. You have know your customers and respect your audience and if this means leaving them alone, then do so; here’s a link to a great post with a list of email mistakes to avoid.